The Chichester Music Festival's Guitar Section (2001) was held at The Regis School of Music, Sudley Road, Bognor Regis. Adjudicator in the Guitar Section was Mark Eden. 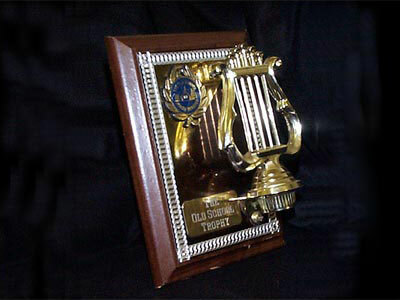 hago was awarded first place in the Guitar Orchestra category and held The Old School Trophy - pictured right for the year. Isle of Amor - A performance which was full of sunshine. I enjoyed this performance as much as everyone who was performing. The ensemble is very good with some very effective dynamics, which could be used even more. The melody was always strong throughout the performance, only occasionally the accompaniment got a little over-excited, but overall the balance was good and very strong.